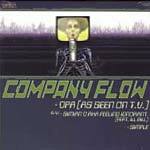 In order for EL-P to market his new label this had to be released using the name Company Flow (minus Bigg Jus). Mission accomplished! It got people talking early on about Cannibal Ox and RJD2 and definitely had us all looking forward to what EL had planned for the future of the label...the rest is history. Now what are you waiting for?!?! Get this, because you can't get 'Simple' or 'D.P.A' on any other release!